While the history of prison riots is substantial, other generations of inmates did not simply idle by. The state had near total control over the lives of its inmates: prison wardens and guards determined when inmates slept, where they worked, whether or not they required medical attention, and even when they were allowed to speak. In their time within the correctional system, scores of inmates executed ingenious methods for reclaiming some sense of their lost autonomy. This was resistance; in this case, resistance is any act that defies the rules set in place by administrators. This everyday resistance was a common occurrence. Actions as simple as styling another prisoner’s hair or defending a bird’s right to live are resistance when a prison bans interpersonal contact or announces that some beloved avian companions will be killed. Deciding to resist requires standing against the prison’s rules and regulations. Everyday resistance often exhibited a certain degree of creative genius, a keen eye for loopholes, and outright bravery in the face of an overbearing authority. Due to the nature of this resistance and the means that sparingly recorded it, it is necessary that this section covers a wider time period than others in this exhibit. Many famous figures and events through Michigan correctional history are memorialized by their acts of resistance. Daring attempts at escape provide some of the most common and outright means by which inmates revolted against their prison. A famous early example is the Jackson Robber Gang. On June 1st, 1840, twelve men fled the Jackson Prison through a temporarily opened gate and holes dug under a fence. Two were immediately caught, but the other ten went on to form the infamous gang, which terrorized Jackson’s citizens before a fatal encounter with Joe Videto . Among several other instances, other notable escape attempts included prisoners sneaking out of a cramped opening in a coal mine and a prisoner hiding in a box in a bid to get shipped out of the prison . Escapes and prison security maintained a coevolutionary relationship as both became more extreme over time. One attempt saw prisoner Dale Remling wander in the woods all night until he somehow appeared roughly 15 miles away at a bar in Leslie, Michigan. He had convinced accomplices outside the prison to hijack a helicopter, only to fumble and miss his escape vehicle amidst the chaos of landing . Another dauntless attempt in 1932 saw two women on the outside plot to blow up a prison wall. Their plan was foiled, however, when they were caught and arrested . Women play more than a mere supporting role in the history of incarceration in Michigan. In the early days of the MSP, women were housed there alongside men. Over time, a need for a prison specifically for women arose. The Detroit House of Corrections, opened in 1861, was eventually repurposed as a women’s correctional facility. Attempted escapes were common here--an article in the Northville Record (a local newspaper in Northville, Michigan) from May 1977 described five women successfully hopping a wall and fleeing, despite recently buffed up security . Outside of escapes, the women there carried out their own creative resistance similar to that of the male inmates. Showing as well a prowess for negotiating in the court of public opinion. In May 1957, the women of the Detroit House of Corrections (DeHoCo) initiated a protest, refusing to work until they could air their grievances and see them published in the press. 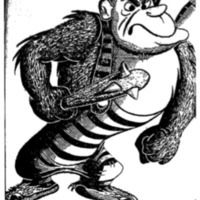 Their list of demands can be found in an old copy of the Detroit Free Press pictured below. 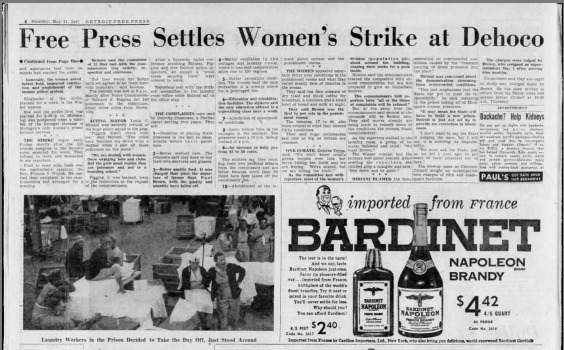 This Free Press article details the women's strike. Exposure to the press was one of the women's demands for the strike to end. A cockroach fitted with a cigar by inmates craving a smoke. The men in Jackson were no strangers to protests or riots, either. In 1952, the inmates in Jackson rioted heavily. They, like the women at DeHoCo, had a list of demands to be met before they would cease their demonstration. Included in these demands were requests for representation and adequate accommodations and treatment from the facility and those employed by it . Protests have a much longer history than that; on Thanksgiving in 1935, the water went out and, according to a Lansing State Journal article from the time, the inmates “staged a demonstration” . By that point, the guards must have been used to it from this group, as on the previous Tuesday, the inmates had organized over their food being too heavily seasoned . The following year, tensions escalated, and another riot over food left more than 100 men in solitary confinement . Earlier instances of organization and negotiation exist, and sometimes arise from odd situations. This was not the only case in Jacktown where wildlife played a role in resistance. John Purves, the prison’s nightkeeper in the mid-19th century, recorded several of his observations from his long tenure at MSP in The Nightkeeper’s Reports. His progressive attitude, which greatly contrasted from that of other prison administrators, enabled some harmless routes of resistance to persist longer than they would have under other authorities. For example, although the prisoners produced cigars during the day, they were not permitted to smoke them. One night, as Purves was making his rounds, a familiar scent wafted his way. He lit his oil lamp and set out to find the culprit. It should be noted that the prison had an issue with very large cockroaches, about 3 to 4 inches in length. An inmate had attached a lit cigar to one of these oversized insects, as well as a string with just the right length so that the cockroaches could be used to transport the cigar from one cell to the next. The cockroach frantically scurried down the hall as each man pulled him in for a drag of tobacco . Purves did not issue any infractions that evening. In fact, he later wrote in his journal that he was “astounded and confounded at the ingenuity of the human imagination to figure out ways to find a bit of pleasure even in the direst of circumstances” . This creativity was a common occurrence in other areas as well, especially with the unpopular Code of Silence. The Code of Silence barred prisoners from speaking unless they were spoken to. 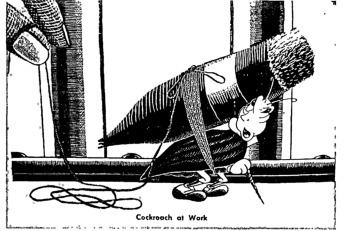 Taking careful note of the specific ban on “speaking,” many prisoners found other, more clever uses for their voices. As Judy Krasnow wrote in Jacktown: History and Hard Times at Michigan’s First State Prison, “There were screamers, weepers and howlers” . She mentions one inmate who “incessantly crowed like a rooster,” and another who “whistled painfully shrill sounds” . If the inmates were lucky, they were bribed with something such as an extra muffin in exchange for their silence. More often, however, they faced awful punishment, a harsh penalty for their brief reprise from forced silence. While some inmates found catharsis through creative noise-making, others found a way to secretly communicate, even while under constant surveillance. On one occasion, someone smuggled an instructional publication on sign language into the prison. After a few prisoners had learned to communicate, the guards wondered why so many inmates were haphazardly waving their arms. After a while, they realized that the inmates were not simply scratching, swatting at bugs, or randomly gesturing. Instead, they were conversing. The inmates would stick their hands out of their cells, gesture at one another, and strain their eyes while waiting for a reply in kind . After prison authorities caught on, the Code of Silence was updated to ban silent communication . Everyday resistance has a rich history in Michigan. Inmates faced harsh circumstance, but did everything in their power to alleviate the stress placed on them by the state. The small stories documented here are a few among many. Ultimately, authorities drove to eliminate any sense of camaraderie and any semblance of individuality, with the end goal of creating a spiritually lobotomized prison populace. These tales of Michigan’s inmates are historical proof that our prisons have never succeeded in full. 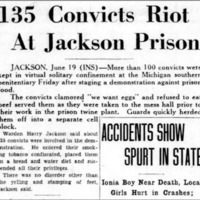 “135 Convicts Riot At Jackson State Prison.” Lansing State Journal, June 19, 1936. Newspapers.com. Inmates of 1952 Jackson Prison Riot. List of Demands. Manuscript. Jackson, Michigan. Department of Corrections Agreement, April 23, 1952. (Accessed November 30, 2018). Golden Jr., Harry and Ralph Nelson. “Free Press Settles Women’s Jail Strike.” Detroit Free Press, May 11, 1957. Front Page. Newspapers.com. Golden Jr., Harry and Ralph Nelson. 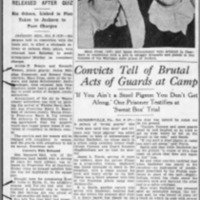 “Free Press Settles Women’s Jail Strike at Dehoco.” Detroit Free Press, May 11, 1957. Newspapers.com. 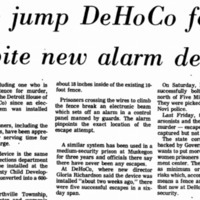 "Five jump DeHoCo fence despite new alarm device." The Northville Record, May 2, 1977. Northville History. Krasnow, Judy Gail. Jacktown: History & Hard Times at Michigans First State Prison. The History Press, 2017. Judy Krasnow’s book was an incredibly vital resource in understanding everyday resistance of Michigan’s prisoners. Ms. Krasnow delved deep into the lives of the inmates and prison workers to paint a better picture of what Industrial Era Midwestern Penitentiaries looks like. The majority of information drawn from Krasnow came from chapter 7 of her book. (pages 73-87), which covered John Purves and the tale of the Canaries. On page 57, there is an in-depth description of the code of silence imposed on the prisoners. 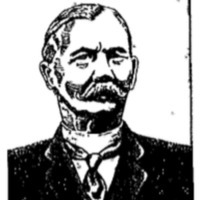 The Jackson Robber Gang was memorialized on pages 38-40, and Edgar Hannibal's story is covered from pages 93-99. 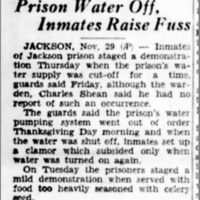 “Prison Water Off, Inmates Raise Fuss.” Lansing State Journal, November 29, 1935. Newspapers.com. “Threat Bared To Kill Baby In Bomb Threat.” Lansing State Journal, October 8, 1932. Newspapers.com. Hannibal was a prisoner famous for his resistance. One tale of his resistance is among the most touching; he sneakily knitted a scarf and emotionally presented it to Mr. Purves as a gift. A drawing of the MSP's fateful nightkeeper. An example of women's resistance at the Detroit House of Corrections from the 1970s, where five women escaped a well-guarded prison wall by going over it. This article contains the story of when six people conspired together to blow up part of the prison in order to aid escapes. A Lansing State Journal article detailing the aforementioned demonstrations which took place when prison water was shut off. A LSJ article detailing a 135-man riot at Jackson.